As parents we all remember having to wake up early in the morning and rushing to school with a bagful of books – that often weighed more than we dd. Once back from school, it was time for tuitions – Maths, Science, English, Hindi, Algebra – a long list that barely left us with enough energy to go out and play. But thanks to the onset of technology, this is not the case with the millennial generation. A quality education can now be ensured at the click of a mouse. There are several reputed educational websites these days which help kids via online tutorials, visual learning aids and expert guidance from professional tutors. All this at the fraction of the usual costs with the added convenience of studying from within the comforts of your own home at a time of your choosing. According to industry data, the domestic market for online education market was valued at $247mn in 2016. This figure is now expected to touch $1.96 bn by 2021, driven by an astounding CAGR of approx. 52%. The number of active users is also expected to see a corresponding jump from 1.6mn (2o16) to about 9.6mn by 2021. 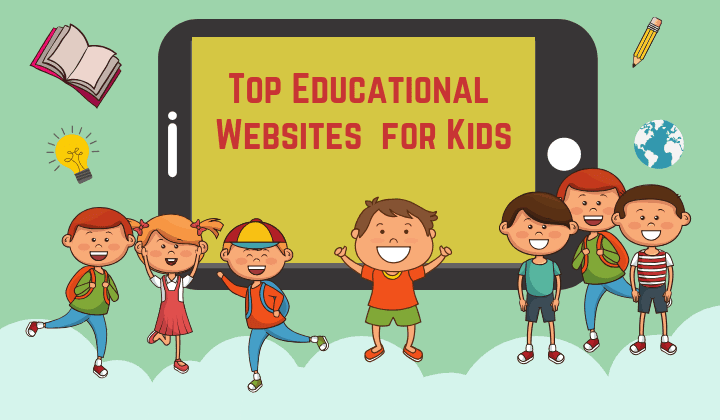 So if you’re a parent looking for a credible online resource to hone your child’s academic skills or a student searching for better online options, I have put together a checklist of 13 credible online educational websites for kids. Take a look. One of the top-rated educational websites for kids in India is Kids Know It. Founded in 1998, as a teacher’s classroom project to provide kids with a reliable fund & educational sites to spend their free time, this FREE website is now their window into the many exciting aspects of our Universe. From knowing about the deepest depths of the ocean to the number of moons orbiting Saturn, curious kids can learn all about it here. The website also offers a great selection of fun activities, free online classes, fun information and online educational games to make it even more exciting for kids who come aboard. Games, Jokes,Activities, Explore, Recipes, Podcasts, Quizzes, Craft Challenges and Apps – you can find all this and more on this website. This kids website is an online extension of – Highlights – a popular monthly magazine for kids aged from 6-12, and part of an extensive kids’ product portfolio which is available in over 40 countries in 16 languages. Devoted to the mission of providing fun with a purpose for the last 70 years, highlightskids is also available as an App on both Google Playstore and the App store, to help kids enhance their creativity and become their best selves. An Essel-group enterprise and the largest pre-school chain in Asia, Kidzee claims to have touched the lives of over 4,50,000 children in India and remains focused on nurturing the – unique potential – in every child. As an online learning platform for kids , the website provides a common platform for kids, parents and teachers to foster child development and improve teacher-student-parent communication. Programmes are also regularly revised and updated in keeping with changes in the academic curriculum and are customized to help every child discover their own creative and aesthetic boundaries. Staying true to its name – Pitara – which translates into a ‘chest full of surprises’, Pitara has been one of the most popular educational websites for kids to learn, discover, explore, play and enjoy for close to two decades. It’s known for its amazing range of multi-lingual, inclusive educational content that spans popular features/stories, science for kids, children’s fiction, famous biographies, quizzes and lots of fun information, which has also been licensed to some of the world’s top producers of children’s content. So if you’re a parent on the lookout for an online learning for kids that provides high quality educational reading content – for free – for kids, you definitely need to check out this website. This is a free kids educational website believes in providing a free world-class education to anyone, anywhere, relying strictly on donations to stay afloat. For students looking to master subjects like math, history, art, science, computer programming and economics, they offer a host of practice exercises and instructional videos. It also includes a personalised dashboard that allows them to study at their own pace. They also regularly partner with reputed institutions like The California Academy of Sciences, MIT, NASA and The Museum of Modern Art – to showcase updated and specialised content. Are you a student with an insatiable thirst for knowing – how stuff works? Then this educational website should be just right for you. It contains award-winning sources, of easy-to-understand and reliable answers to how things actually work. From reincarnation to escape rooms, Tibetan ice glaciers to social engineering and fried chicken to why Americans celebrate Labor Day – this website has the answers to all your questions and more. No wonder they claim to attract nearly 30mn visitors every month. What’s more it’s also available on other platforms including; audio podcasts on iTunes, video channels on YouTube and award-winning apps on iPhone, iPad and Android. Since its launch in 2003, Science News for Students has built a reputation as an online provider of age-appropriate, in depth and the latest science news to its readers which includes learners, educators and parents. The website covers science related news and features covering subjects that include; health, environment, psychology, genetics, space, physics & chemistry and the human body to name a few. While a bulk of the science related news and content is freely available on this award-winning website, access to some articles and their collection of archived content requires a paid subscription for full access. Available only on the App Store for iOS devices, this free app attempts to teach kids the basics of programming using the antics of Daisy the dinosaur. Built by the creators of the award-winning app Hopscotch, Daisy the Dinosaur allows kids (of all ages) to animate Daisy and make her dance to their tunes using an easy-to-use interface. It’s designed to help kids grasp the basics of sequencing, loops and events by solving simple challenges, thereby providing young kids with a fun introduction to programming. This educational website in India targets youngsters aged 6 years and above who are interested in knowing more about the fundamentals of computer science. To make it even more interesting the website also has free resources which cover the basics of coding to give kids a taste of the creative world of app-making. Code.org is also famous for its – Hour of Code campaign– designed to demystify ‘code’ and to show that anybody can master the basics. The campaign has since become a global phenomenon, supported by 400+ partners and approx. 200,000 educators worldwide, including India. This free iTunes/Android app is a great place for online learning for kids especially math tools needed for graphing, geometry, 3D, and more. It also combines statistics, calculus, algebra and spreadsheets in one dynamic package – making it apt for all levels of education. As a leading global provider of mathematics software, GeoGebra is available in multiple languages. It is already being used by millions of young students across the world, courtesy its ease of use and many features. Interested in taking your child’s language skills to the next level. Try Lingvist. This site for kids offer several paid programs which use artificial intelligence to adapt to the student’s abilities, track their learning patterns and then proceed to customize their lessons accordingly. To enable the student to make faster progress, the lessons are bite-sized and can be done anytime during the day. A handy app (iOS & Android) makes it easier to do while commuting or taking your lunch break. Lingvist currently offers students the chance to learn four languages namely; German, French, Spanish or Russian. A winner of the prestigious Jackson Hole Science Media Symposium’s 2014 Best Online and Interactive Media Award, this free app is an interesting interactive tool that teaches kids about acoustic phenomena, auditory illusions, and sound-processing. In other words, you will get to understand why things go bump, beep, boom, and vroom – using just your eyes and your ears and this app which will put you in the center of all the action. So if you have ever wondered, why some noises seem louder at night, are there secret messages in music played backward or how can Siri understand different accents – this app has all the answers for your questions. At its core hippocampus is a free, educational website for kids that is facilitating the spread of knowledge globally, by offering free educational resources from middle school to college, using rich multimedia content. The site offers over 6,800 videos, animations and simulations spanning 13 subject areas which include; Mathematics (Algebra, Geometry, Arithmetic, Calculus, Statistics), Natural Science (Biology, Physics, Chemistry & Earth Science), Social Science (Economics, History & Sociology) and Humanities (English & Religion). And the best part? Users don’t need to pre-register or log into the site to gain access to the rich content. The fact that computers can have a positive impact on the learning capacity of a student was already documented way back in 2000 by researchers like S Hooper and B Hokanson. It’s only in recent years that we are beginning to see growing evidence that proves this much-debated theory. A large part of the credit for this goes to the rapid development of technology and websites providing quality kids education which has allowed them to learn independently – at their own pace. It only goes to prove that with the calibrated involvement and intervention of parents and educators, online educational websites for kids can be an effective tool to not just engage them but also encourage their natural curiosity to learn and explore.